Here you see just two samples of current and historical designs. For detailed information on flying cars please visit roadabletimes.com. This site covers nearly the entire field of Roadable Aircrafts and Flying Cars. Moller has developed, built, and flown a two passenger prototype model of a Volantor. This Volantor is a new type of aircraft that combines the performance of airplanes and the VTOL capability of helicopters in a single vehicle without the limitations of either. The Moller M150 Skycar was designed for single person VTOL. Moller has made some other attempts on VTLO's since the early 60s. None of them are available for sale. These include the XM2, Moller's first attempt, the XM3, his second, the XM4, his third, and the M200X, which led up to the Skycar. You will find detailed information about Moller at www.moller.com. The imagery is taken from this site. 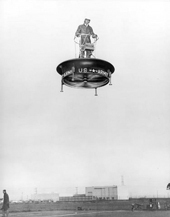 The Hiller 1031 Flying Platform was a disc for one person standing and flying. Hiller Aviation in Palo Alto, California, developed the flying platform in association with the US military in the 1950s. The goal was to use the platform to spot artillery or move troops over tough terrain. To steer, the pilot shifts his weight. Four shock absorbers helped out with the landings. Only seven flying platforms were ever made, and the military scrapped the project around 1956.